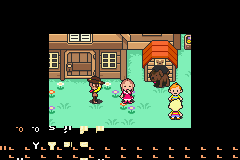 Jeffman’s been on a huge MOTHER 3 hacking roll lately! Besides fixing old bugs in the game and documenting the ROM layout for everyone to see, he recently uncovered six ending images that didn’t get used in the final version of the game! I think I found some unused scenes from the staff credits. I’ve looked through some playthroughs and they all seem to have the same set of 18 scenes, but the ROM contains six extras that I haven’t seen before (ignore the glitches in some of these). I don’t think there’s any way of accessing these normally right now via codes or anything, though. 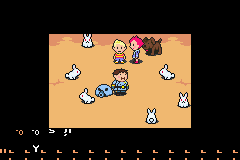 Still, to this day it surprises me whenever we find something new in the EarthBound ROM, but I think the MOTHER 3 ROM is going to be the ROM that keeps on giving for years and years and years to come! After story pig mask picture look great. 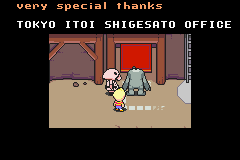 So, Itoi knew EarthBound was coming to the Wii U VC in Europe in 2006? Then I answer myself saying that it would have been difficult to take all of that data out. But I still ask myself this. Hey (To)Mato, just curious about something; it’s unrelated to this though. Has Itoi commented on the western release of EarthBound on the Wii U VC? Any tweets, blog posts, anything at all? I don’t know – I haven’t been actively following his tweets and no one’s mentioned anything to me about him saying stuff that I can recall. While even the promo for it was in French, apparently it’s available only in English and Japanese atm. 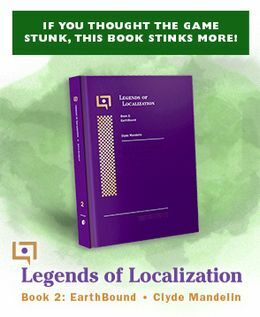 Une dernière question pour finir, même si vous ne pourrez peut-être pas me donner de réponse : Mother 2 (Earthbound), qui va sortir sur console virtuelle en Europe, aura-t-il une traduction en français ? Donc c’est une possibilité ? Je ne vais pas vous faire d’annonce ou quoi que ce soit, mais on a noté qu’il y avait un intérêt d’une petite partie de gamers pour ce titre-là, de la même manière qu’on a bien noté l’intérêt des gamers pour Bravely Default. Alors est-ce qu’on fera quelque chose dans ce sens-là, on vous le dire plus tard mais pour le moment je ne peux pas vous confirmer. Nous on regarde ce que pensent les gamers et on voit qu’il y a un intérêt pour une niche et même si c’est une niche, parfois on y va. Check out how the dad isn’t in any of the pics except the last where hinawa is alive. Think someone needs to come out of the closet! It’s only logical that he wanted his son back, which is why he doesn’t appear in most of these pictures. Which is nice. 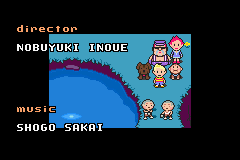 Itoi left us with a lot to do in the last installment. 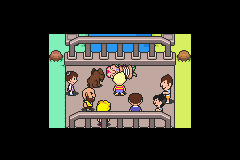 Has anyone noticed that the unmasked Pigmask on the 5th picture looks like Apple Kid from EarthBound? @Anders If you mean the last magypsy, they’re heavily implied to be Fassad. The last magypsy is Fassad, it is not only heavily implied but CONFIRMED. 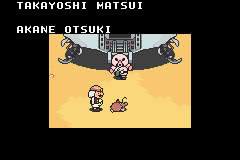 Speaking of Mother 3, when’s version 1.2 coming out? There’s no set date or anything but I have a rough idea of the end of the year in mind right now. Are you going to include the Duster instrument fix in the 1.2 patch? Yeah, the fix will be in there.